substantial gaming too. Though I must focus on the gaming for this post (this is a game site, after all) a few words about the convention itself is appropriate. Phoenix Comicon is friggin’ HUGE! I make that statement as a yearly attendee of Gencon and am well versed with crowds of geeks. I attended PHXCC for the past five years and this year is by far the most crowded. (Proven through the number I just received from PHXCC, unique attendance of 106,096) Though it did make navigating some areas very difficult. I was especially impressed with the vast number of vendors in the exhibitor hall. That said, I heard reports that the badge pick-up line on Friday was brutal. Phoenix had a heat wave that pushed the temperatures above 110 and some poor, damned souls waited in line outside for extended periods of time. Hopefully they get this issue resolved for next year as Arizona heat is lethal. Meanwhile, take some advice and go on Thursday to pick up your badge. There was a 10 minute, indoor wait. After a quick tour of the vendor hall (no money spent, Gencon draws nigh) I planted myself in the Phoenix Hyatt Atrium for a day of gaming. After a tasty breakfast buffet ( I trade cash for time. I refuse to wait in line for a bagel at Starbucks when for a few extra dollars the restaurants around the convention center have zero wait.) I jumped into a table of “Star Wars: Rebellion.” We played the four-player scenario with two players taking the role of admiral and general for the rebellion and the empire. At a high level, Rebellion reminded me of “Axis and Allies” with the territories = money and then building units with the cash earned. However, there is a “hero unit” element added where you deploy characters to complete missions and earn rewards. The missions have different types and the characters different strengths, so sending Chewbacca to do a diplomacy mission is a bad idea. Mon Mothma is the woman for the job. Want to subjugate a planet to the Imperial will? Send Darth Vader to crush them utterly. There is quite a bit of strategy regarding who to send to which planet as you can counter an enemy mission by sending your own hero to oppose them. I did like that victory conditions were totally different for the empire and the rebellion. 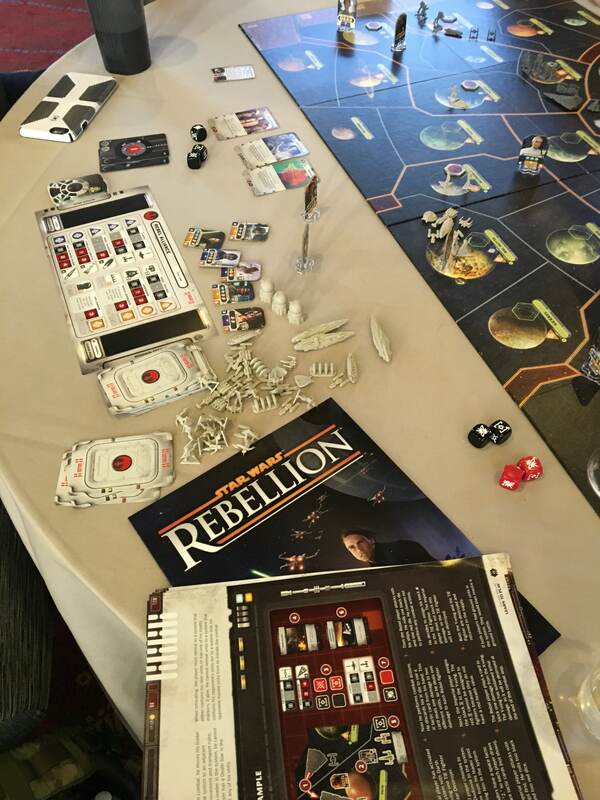 The rebellion wins if it stays operational and undetected until the turn counter reaches zero. The empire wins if they kill the rebels, regardless of the turn. Components were nice (Fantasy Flight, so this is expected), but game play did not excite me. I had a good time playing this game, but it seemed so familiar that I doubt I will invest. I suspect this game would not do well if you stripped the “Star Wars” license off of it. 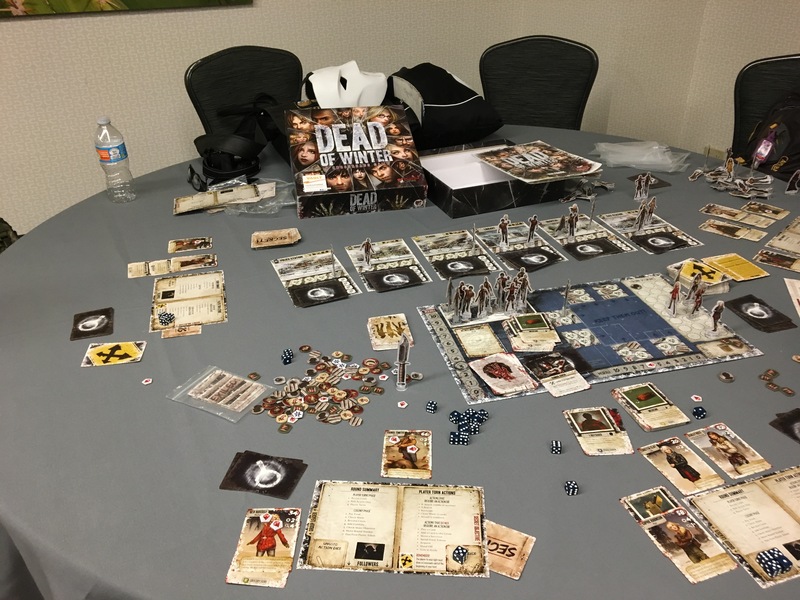 A co-operative game with a potential traitor, the players control a small group of survivors holding out against a ravenous horde of undead. We had four players and no experience so we went with the introductory scenario that required us to gather 12 zombie corpses for research. 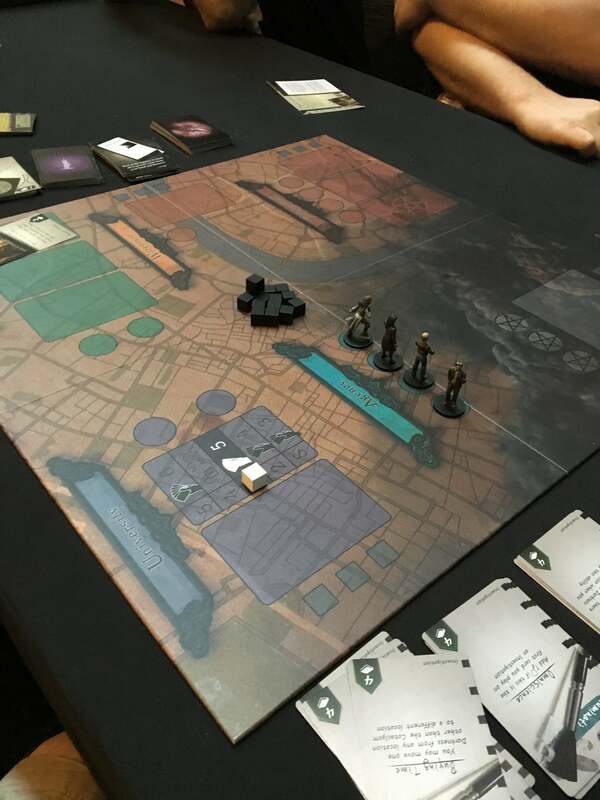 “DoW” plays much like “Pandemic” with players moving around the board taking actions, fighting zombies and gathering resources. You fight a deck of card, each one demanding you complete certain actions ( gather 5 food) before the end of the round. Traitors can secretly sabotage these efforts to achieve their dark goals. We had to kill 12 zombies (and roll higher than a 4 on a d6 for each kill, which means we had to kill more than 12) before time ran out. Our strategy was kill early and kill often. Thanks to some amazing luck, we pulled rifles which gave us “free” (no risk to the character firing) kills each round. We were making progress when a player with a small lake of gasoline cards in his hand got an item that let him napalm multiple zombies with a single can of gasoline. Flaming carnage ensued and we beat the scenario. This game is a great time and I look forward to playing it again. “SoW” is a deck-builder combined with a location based co-op game. The players are investigators from various factions ( I played the Illuminati guy. I always play the Illuminati guy. My cohorts are beginning to suspect something….) working to discover what vile creature threatens the world. You start with a hand of basic cards and by completing sets of cards of the same type you “defeat” creatures and draft more cards. “Exposure” cards are just junk cards that fill up your hand and are a major burden to the characters. Players work together to gather enough “wins” to determine what monster lurks beneath the “big bad” card and defeat it. The various board locations limit how many characters may “attack” a creature. So if you go to the “warehouse” location and do not have enough mojo to defeat the monster you are in deep trouble. One interesting mechanic is a “reserve area” where you can stash cards for future use. A fun, light game that played in less than an hour. My final item of note is “Orig3n.” Though not game related, “Orig3n”offered a convention first for me: genetic testing. No, this is not science fiction, they sequence DNA and send you a report. The primary offering was a “superhero potential” genetic test that reports on your genes for intelligence or strength. I nearly went with that because it appealed to the amateur scientist in me, but instead I purchased the “Fitcode” test. “Fitcode” evaluates your genes for fitness performance, whether you are built for sprinting or endurance or if you take longer to recover from exercise. My report is due back in a few weeks and I intend to do a full post on this fascinating service. Phoenix Comicon 2016 was amazing and I swear to myself every year I will try to go two days instead of one. Hopefully next year I will make it. Torchwood: Miracle Day–What The Hell Went Wrong? Soda Pop Miniatures Limited Release–Ayu Beat! April 25, 2010 trask Comments Off on Soda Pop Miniatures Limited Release–Ayu Beat!